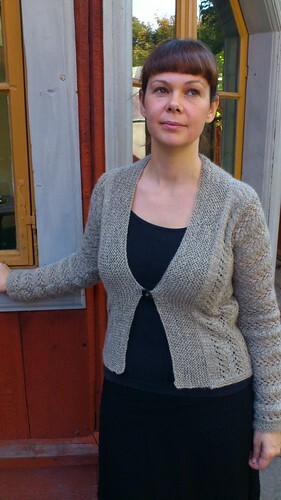 my new (not green) cardigan is finished and i’m very satisfied with the result. 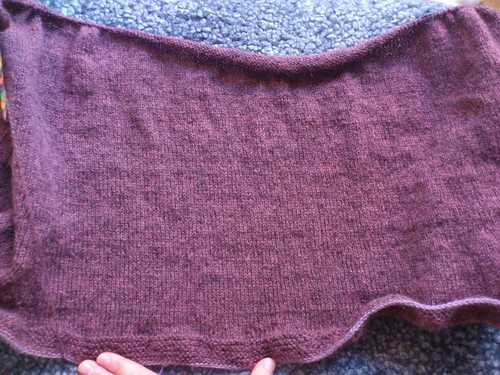 even though i doubted the design of it, especially when the knitting bit was done but i still had the seaming to do. it looked rather strange and small. 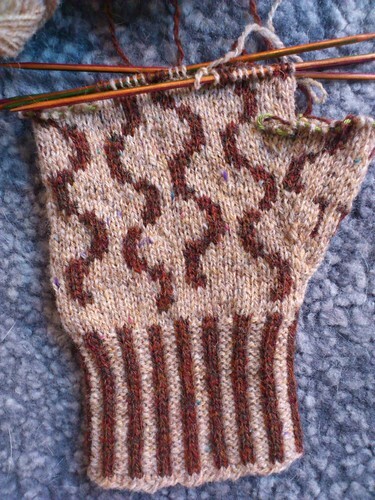 but now i’m convinced that i did the right thing when i knit up the smallest size and added some modifications. 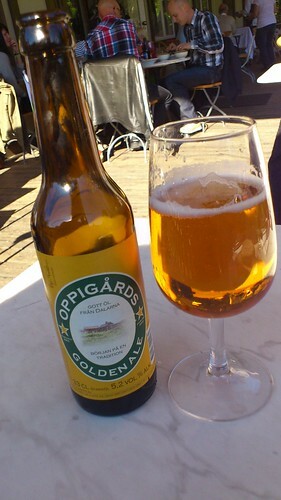 and to celebrate the finished knit, i had a golden ale from oppigård micro brewery! the photos were at taken at skansen. 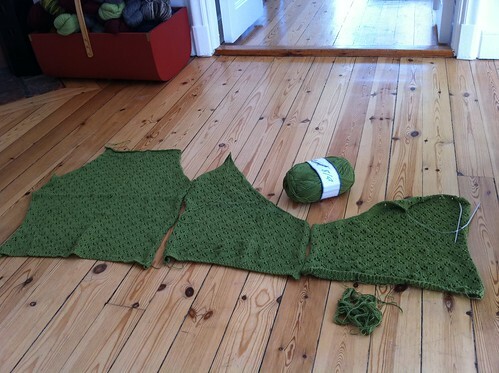 on an impulse, i decided to try to finish this old thing instead of buying new yarn for a summer project. 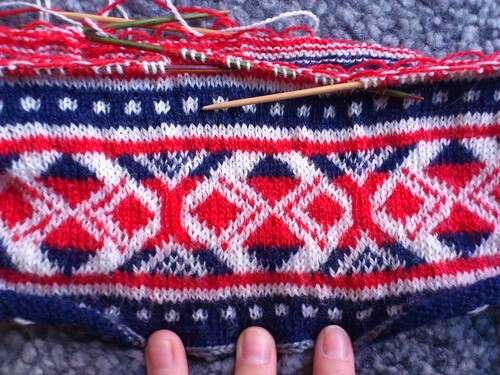 i started this cardigan in june 2005, so if i finish it soon, it will only have taken me six years! and i’m really looking forward to wearing it! does this mean that i am totally unaware of current fashion or that the design is timeless? i’m going with timeless design. 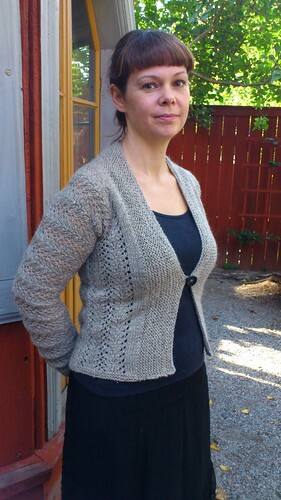 there was even a kal for this wrap/cardigan way back when that i joined with great enthusiasm. experience has since taught me not to join knit-a-longs since they are the kiss of death for my knitting projects. 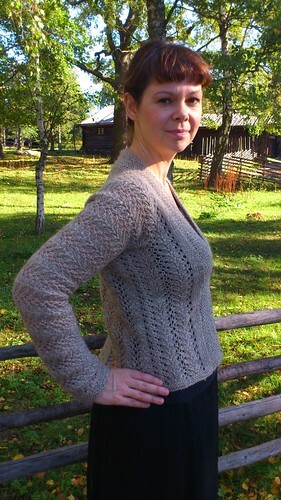 join a kal and loose all enthusiasm! 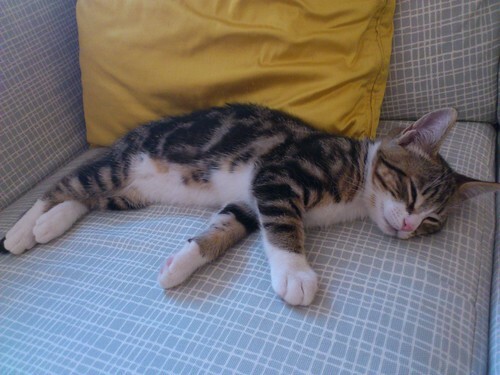 don’t misunderstand me – they’re great – but they don’t work for me. anyway, i found a finished back, a finished right front and the beginnings of a left front in an old knitting bag and decided to give it another go. luckily, i’d scribbled all my project notes into the book, so it was easy just to pick it up where i’d left off. 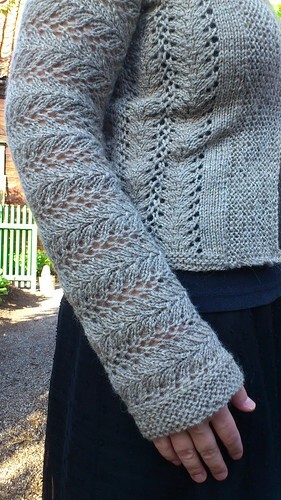 the tricky thing is always gauge of course, my gauge tend to change from day to day, but so far it looks ok.
i only have a few cm left on the second sleeve and a veeeery long neckband to knit and after that it’s time to block! my goal is to finish the whole thing by the end of the week. i have no idea if it will actually fit in the end. i guess we’ll see! 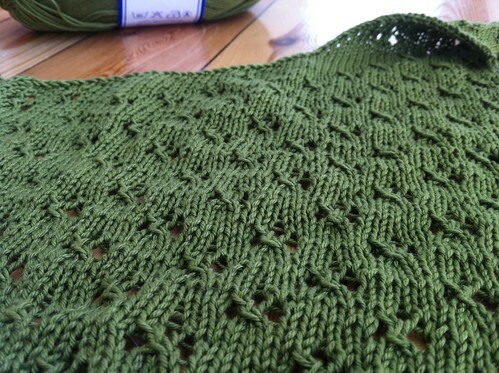 i actually have a bunch of fo’s that i haven’t blogged, i’ll try to remedy that soon.